Greenbank Road Bible Christian Chapel, an off-shoot of the Zion Bible Christian Chapel, was located on the corner of Greenbank Road and Hospital Road. It was also known as Greenbank Bible Christian Chapel. 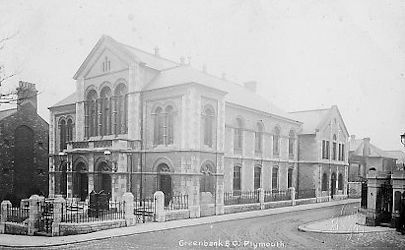 Greenbank or Greenbank Road Bible Christian Chapel, Plymouth. Note the gap between the Chapel and the nearby house. It was designed by Mr Henry Snell and built in the Romanesque style by Messrs Jenkins and Son of Marlborough Street, Devonport, at a cost of £4,269. The site cost £849 10s. In all, nearly £6,000 was spent on the project. The gas fittings were installed by Mr Bannerman of Tavistock Road, Plymouth, and included two beautiful brass corona pendants in the centre of the Chapel. Although it would seat 700 people, the roomy pews, aisles and passages meant that even more worshippers could be admitted on special occasions. There were sloping galleries and there was a fall of twelve inches between the rear to the front of the Chapel. The rostrum was raised on a dais in front of the organ loft. There were school rooms upstairs and in the basement, to accommodate about 500 children. No money was wasted on ornate internal decorations but it was hoped that money could be raised to stencil the arches and pick out the front of the gallery with gold. 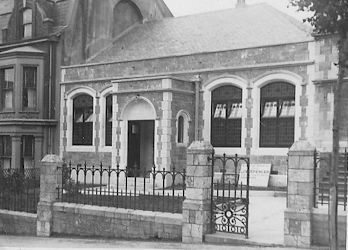 Greenbank Road Bible Christian Chapel was opened on Wednesday October 6th 1886. An organ built by Mr George Tucker of Plymouth was installed in 1890 and the following year the Chapel played host to the Bible Christian conference. On Thursday May 18th 1933 several foundation stones were laid for the Matthews' Memorial Hall. This was to be built in the gap between the original Chapel and the nearest house. It was funded by £2,000 bequeathed by Mr Ephraim Matthews, a former boot maker. Mr S Titball and Miss Dorothy Norrish laid the official stones and were followed by 40 others laid by subscribers. The architect of the new Hall was Mr H J Hammick. The ceremony was attended by the famous evangelist, Mr "Gipsy' Smith. After expending £2,513, the Hall was officially opened by Mr W H Gully, of Tavistock. Naturally the ceremony was followed by a luncheon. The Hall opened in 1933 alongside the original Chapel. In its latter years, the buildings were used by the hospital across the road for non-medical purposes. The Devon & Cornwall Housing Association were to purchase the site in April 1979 for £27,500 and planned to replace the Chapel and Hall with a four-storey, L-shaped block of 40 apartments for the elderly and disabled. Mr Frank Bush was the architect and the cost of the new brick building was estimated to be £450,000. The accommodation was to be mostly of one-bedroom, two-person units but there would be one single-person unit and four two-bedroom, three-person units. Work was due to start in September 1979.